Denny Hamlin finished 13th in Saturday night’s Coke Zero 400 at Daytona International Speedway, surviving a variety of wild crashes during two ‘green-white-checkered’ overtime restarts and spinning through the infield grass to the finish line in the #11 FedEx Express Toyota Camry. 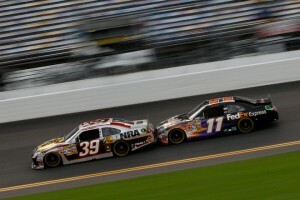 Hamlin took the green flag for the final restart in fourth place behind draft partner Ryan Newman, and the pair was alongside the leaders on the backstretch of Daytona’s 2.5-mile oval. Another duo with a run made a move to Hamlin’s outside, causing the #11 to lose contact with Newman’s #39, and they slipped back in the running order. They hooked back up at the white flag on the cusp of the top-10 and were building momentum to move back to the front, but a multi-car incident in turns three and four coming to the checkered flag caused both drivers to scatter, Hamlin into the grass and 13th behind winner David Ragan. The tandem draft style used at the restrictor plate tracks (Daytona and Talladega) was prevalent throughout Saturday’s 170-lap event. Hamlin has worked with Newman in all three races at the two venues in 2011. They were content riding around deeper in the field to avoid any wrecks at the front for most of the first two-thirds of the race, switching positions to keep the engines cool. As the laps clicked, they moved towards the front, and Hamlin led once for four laps after starting 36th. Green flag pit stops cycled twice in the 50 laps, and Newman and Hamlin were running one-two when the caution flew with two laps to go in regulation. They started from those positions on the initial “green-white-checkered” attempt, but a multi-car wreck behind them caused another caution and the second attempt. The finish kept Hamlin 11th in the NASCAR standings following Daytona, just three points behind Newman for 10th. He is 91 points behind new leader Kevin Harvick. NASCAR returns to action on Saturday, July 9 for the inaugural Sprint Cup Series event at Kentucky Speedway.